Arunachal Pradesh Chief Minister Pema Khandu today inaugurated the Block A building of the District Secretariat here in Tezu in presence of DCM Chowna Mein, WRD Minister Kamlung Mossang, Art&Culture Minister Dr Mohesh Chai, RD Minister Alo Libang, , State BJP president Tapir Gao, Parliamentary Secretaries PD Sona, Nyamar Karbak, Tesam Pongte, Zingnu Namchoom and Gabriel D Wangsu. Later addressing the govt officers at the secretariat conference hall, the CM appreciated the executing agency PWD for completing the work in 14 months maintaining the quality of work. Khandu assured support for completion of another two blocks of the secretariat. On probability that if the sanctioned fund of Rs 25 crore for the entire secretariat building falls shortage, the CM assured to have it examined in the cabinet for further addition of the funds. For early functioning of Block A, Khandu thanked DCM for his assurance to provide the required furniture and other facilities for the office. He also requested the local MLA and DC for putting all efforts for smooth function of the office in the new secretariat building. The Chief Minister thanked the govt officers and the officials for contributing to growth of revenue in the state from Rs 900 crore to Rs 1600 crore within two financial years. He urged continued cooperation and assured to meet up any grievances of theirs. 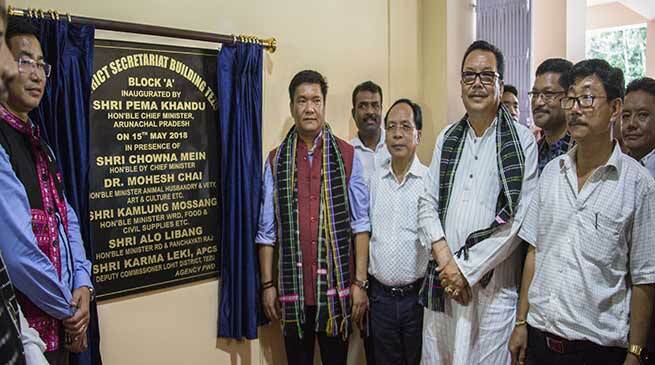 Earlier the Chief Minister also inaugurated the Kalikho Pul Memorial Badminton Club and the Treasury Office constructed by PWD and RWD respectively. He later laid the foundation stone for construction of an outdoor football stadium with seating capacity of 5000 to be constructed at the cost of Rs 36.10 crore.